Hayley Faye self published Blackhearted a psychological thriller in 2013. However soon after that she decided that designing was more her thing. Working through Fiverr she designs book covers, logos, card etc and writes website content. SR: You started off as a writer. 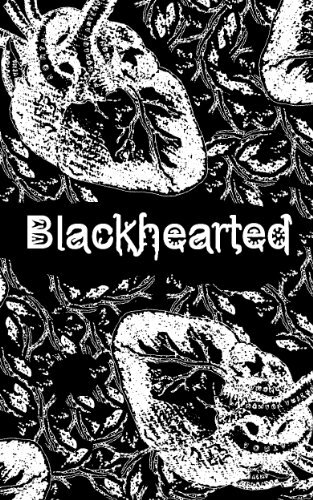 Tell us something about Blackhearted. What prompted you to write it? Why did you choose the genre? HF: I’m not really sure if there was anything specific to start writing it, it just seemed like something I should do at the time and wrote it down. The book is sort of a look at Stockholm syndrome and the relationship dynamics of psychopathy in a sort of mundane and even comical setting, it’s something I think is interesting and wanted to see if I could do anything good with it. SR: Have you written anything since Blackhearted or have you given up writing? HF: I have written for work and occasional small things but I’ve never truly enjoyed it as much as I hoped I would. It takes a long time and I want things to be more in the moment, with photo editing for example I can create or delete any idea I have at any given moment plus I also missed the visual side of a story as I appreciate seeing as part of the experience. I will probably try again at some point as I don’t want to just leave a very interesting and special form of media with it’s own undeniable strengths. SR: How did you become a designer and why did you decide to design book covers? HF: I always loved photoshoping things as a kid messing around with my computer trying to make the funniest things that I could think of at the time. It seemed amazing to me that you could create anything you wanted just by editing existing images, like being able to bring your inner visions to life. Literally. After I made the cover for my own book I thought it was a fun and fantastic experience and ended up joining Fiverr to make covers for others. No real reason, I just did it and it kicked off. SR: What makes a good cover and have you ever wondered if the cover you designed matched the story? HF: That’s why I ask for that type of information beforehand, yes a mismatched cover would simply be awkward if I happened to read to book and knew I missed the mark in some way. I do my best to keep that from happening, a good cover should reflect, invite and inspire. SR: What inspires you to design and what have been the best covers you have designed? HF: I love making pretty things to look at, and tease me an experience by delving into what’s behind them. As for any favorites, I like fantasy and science fiction as they tend to be exactly what I want, stunning and deep. SR: You work online and never speak to or meet your clients face to face. It is all done through written instructions. Yet judging by the praise for your work, you have delivered every time. How easy, or difficult is it to work this way? HF: It’s easier for me since I can be introverted and would find a long discussion face to face to be more awkward and complicated than just receiving a title, a short description and being let lose to create whatever I can. I love all the praise I’ve gotten, it’s not something I was expecting and I’m very, very happy that I could satisfy so many people and get them one very real step closer to their own goals and dreams. SR: Most of your clients are very appreciative of your work. How do you translate their ideas to design and have you ever had moments when you missed on what was said? HF: That’s why I keep my free revisions offer around, I’m not perfect and have missed the mark many times and had to start over. Usually it’s a lack of information and when things are better clarified and explained I can do it much better a second time around, which always succeeds. SR: Book cover designing is growing with many designers competing. Most designers charge a lot for designing claiming time, effort and cost for buying images, graphic. How do you manage to do this yet keep your costs so low? HF: By being ergonomic and using everything I have to it’s full extent. If I need an image and it costs a lot, I get something else, I take the photo myself, I use free alternatives or edit existing ones I have. Other than designing covers I can also redesign elements in them to get the most out of what I have and reusing them creatively. I also genuinely enjoy my work so whenever I have to make something it isn’t stressful or taxing, just fun… most of the times. lol I use my creativity creatively. SR: Tell us about some of the other designs you do. HF: I make logos and business cards for companies along with adverts and flyers. This is an offshoot of my cover works as many people had asked me for these services and me being the kind person I am said ‘why not’ and made them. People also liked them so I eventually decided to truly focus on that as a side gig.